The National Science Foundation recently awarded Major Research Infrastructure (MRI) funding to UNAVCO and the IRIS/PASSCAL seismic consortium for a unique proposal to design and build a reliable power and communication system for autonomous polar station operation. This three-year development effort will involve close collaboration with Antarctic seismologists and GPS scientists. Continuous, year-round seismic and geodetic measurements at remote sites will meet longstanding polar and global geoscience goals that have previously been unattainable. 1) Design, integrate, and test a scalable power and communication system optimized for ease of deployment and reliable multi-year operation in severe polar environments. 2) Provide an initial pool of these systems for deployment and testing in science experiments. During this project's first field season, all technical goals were realized thanks to intense efforts by the field team and assistance from the U.S. Antarctic Program logistics providers and support staff. Six testbed or prototype systems were deployed in Antarctica, each of which serves a specific function in developing technologies or optimizing deployment. To assess system performance in Antarctic Margin environments (extreme winds, moderate temperatures), a GPS system was installed at Minna Bluff and two independent GPS and seismic systems were installed at Observation Hill near McMurdo Station. For testing under Polar Plateau conditions (mild winds, extreme cold), one GPS system and two seismic systems were also installed near South Pole Station. 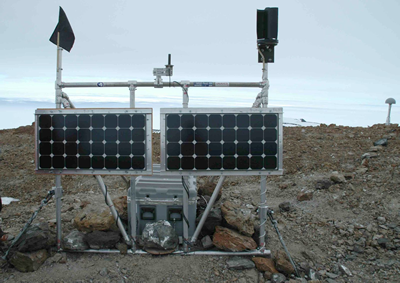 Figure 1 - GPS Prototype Station at Minna Bluff, Antarctica, a site subject to extreme winds and rime icing. 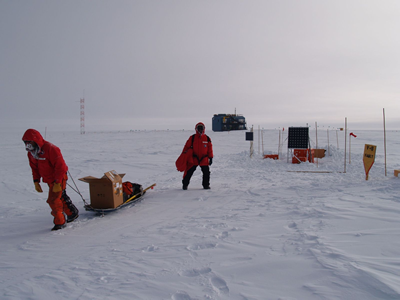 Figure 2 - PASSCAL's Tim Parker continues the age-old tradition of manhauling supplies in Antarctica as Bruce Beaudoin looks on. In the background are two newly-completed seismic testbed systems near the Clean Air (ARO) Facility at South Pole Station.